It is said that Mr. Kingdom Ward discovered this rare beauty in 1946 while searching for missing aircraft in Burma on Sirhoi peak near Ukrhul in Manipur. Found at altitudes of 7000 feet or more, the flowers of Lilium mackliniae are bell-shaped and held in a pendant form. 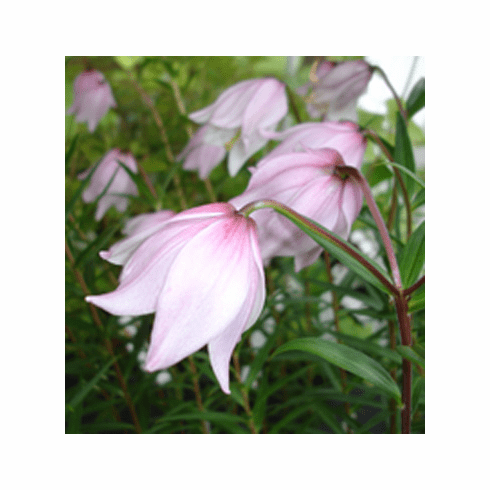 It grows well in cultivation especially if planted in a bed of good draining peat and light shade. It enjoys the same conditions as azaleas and rhododendrons and seems to like their company in the garden. Lilium mackliniae likes our cool, damp climate here in the Pacific Northwest. Our first photo inset is of a stem of L. mackliniae>/I>as grown by Edgar Kline and photographed in the late 1940's. Though faded with time, we found this photo to be enchanting with its delicate beauty. Provided by Bill and Mary Hoffman, this is an excellent example of flower form. Photo inset #2 is of a bed of L. mackliniae taken by Edward McRae. Location of planting not recorded.